The Herald has returned, and with him the Slayers are one step closer to summoning the Hunt and destroying Kaylee and the rest of the dragon-kin. Worse, Kaylee is attacked by a dragon. An actual dragon. The kind that definitely shouldn’t exist. It seems something is forcing innocent dragon-kins to permanently shift against their will. With the arrival of a powerful creep interested in romancing her, and Jade’s Tamer test taking place in the caverns of New York City, a mystery is one more thing Kaylee doesn’t need to deal with right now. But when Jade’s test goes disturbingly wrong, Kaylee enters the underground, determined to find her. What she discovers instead is a Slayers’ plot more dangerous than she could have imagined. One that promises to end her and her friends for good. Some secrets, it seems, are better left forgotten. But now they’re coming back to life. Read below for an excerpt! As a storm dragon-kin, Kaylee Richards had dealt with a lot during her time in the Scarsdale Convocation. She’d summoned raging thunderheads, fought the forces of darkness, and wrestled with mythical creatures that would cause even the most hardened soldiers to rethink their life choices. But this…This was going to be the death of her. Jade cocked an eyebrow and held up the workbook she’d been leafing through. It wasn’t a standard SAT prep or even a textbook, but rather a thick, leather-bound volume Edwin had provided her. The pages were full of dense, cramped writing, but it included all the dates, dragon-kin elemental powers, important dragon-kin in Convocation history, and places Jade would need to know to ace the written portion of the Tamer test. Kaylee wished Edwin had been able to scrounge up something like that for her SAT’s. As it was, she’d rather be taking an icepick to her eyes than read any more about vocab words she’d never use (Vicissitude? Did anybody born in the last thousand years use that word? ), and data analysis for scientific studies she didn’t particularly care about. It wasn’t that she envied Jade. Not really. Her best-friend-since-forever and Tamer-In-Training for the past two and a half years didn’t want to take the Tamer test any more than Kaylee wanted to take the SAT’s. But her parents had practically required it, and Jade had been prepping for years. And with the threat of the Slayers growing every day, especially now that they had the Book of Kells and the potential to summon the Herald of the Hunt, fully-trained Tamers and Protectors were in short supply. The Convocation was practically begging Jade to join their ranks. Jade flipped to the next page. Kaylee tilted her head to watch, trying not to think about how much in that book she and her friends had already faced. In the last two years alone she’d fended off enough monster attacks and thwarted enough of the Slayers plans to impress even Alastair, the head of their Convocation. Kaylee’s Uncle Randy would say that ninety percent of those attacks were a result of Kaylee sticking her nose where it didn’t belong. Kaylee thought that was rich coming from a guy who’d made it a life’s calling to get involved in things he wasn’t supposed to. Kaylee forced herself to start again on the math portion of the practice test. She and Jade had planned to go shopping and study here in Hansburough, the nearest big city to Scarsdale, before the storm had rolled in. After it had they’d found the nearest library. The study area was filled with other students their age who were supposed to be on winter break, but instead were confined here while those younger than them frolicked in freedom. Only near-silent whispers and the crusty snap of flipping sheets of paper broke the silence. Kaylee chewed the remaining end of her pencil. Her eyes kept flicking to the window, legs jostling, eager to be out and moving. Her usual after-school dragon-kin training with Randy had been relegated to a few times per week thanks to bitter winter weather and holidays. Randy was also gone a lot, out on missions for the Convocation he wouldn’t tell Kaylee the details to. Randy had paused in pushing his motorcycle to the shed, his bundle of deadly weapons and traps he kept strapped to the back jostling with the stop. Kaylee refused to look at them. She agreed with what he was doing—stopping Slayers—but not with his methods. “Show me your dragon wings,” Randy said. “A small one,” Kaylee had muttered. Kaylee had grumbled a no. Randy had nodded. Then he’d wheeled his motorcycle the rest of the way into the shed and shut the door, leaving Kaylee to drag her feet back to the house before she froze to death. They grabbed their coats, bundled up, and pushed their way outside the warm library. Chilly wind immediately nipped at Kaylee’s nose. Passersby hurried past, covered in so many layers Kaylee could only see their eyes. For a brief moment, Kaylee was happy Jade was taking the Tamer test. It was being held in New York City and hopefully—hopefully—it would be warmer than this. “You finish everything you needed to today?” Kaylee asked. Jade shrugged, the bulge of her shoulders moving up and down beneath her thick coat. Kaylee couldn’t understand how. Jade was by far the strongest fighter she knew, short of Randy and Alastair. She was versed in more types of fighting than the superheroes on TV, could wield a variety of weapons, and hold her own in a fight, even outnumbered five to one. “You’ll be fine,” Kaylee assured her. “I just don’t know what to expect,” Jade said. Jade shook her head. Or maybe she shivered. Kaylee wasn’t sure. Her eyes felt like they had frozen in their sockets so it was hard to look over and tell. Jade shot her an ‘are-you-friggin’-kidding-me?’ look. Alastair Dumas, Edwin’s dad and head of the Scarsdale Convocation, was a powerful forest dragon-kin. He was also a stickler for rules and wouldn’t be caught dead giving illicit advantage for something as prestigious as the Tamer test, not even to Jade. He’d been getting on to them the last couple years whenever Kaylee and the others threw themselves into danger against the Slayers. It was only when he realized he couldn’t stop them from getting in trouble that he’d relented and let them get more involved in Convocation business. Better to regulate their level of exposure to potential death than ignore it, Kaylee supposed. Kaylee bumped her, nearly causing Jade to skid on a patch of ice and into the street. She laughed and the two of them hurried inside the coffee shop. No sooner had they stepped inside then Kaylee’s phone buzzed. She hurried to tug off her gloves and rub her numb fingers until the screen registered her touch. “Is it Edddwiinn?” Jade cooed over her shoulder. “Oh hush,” Kaylee said, feeling a flush rise to her cheeks. At least she was warm now. Kaylee glanced around the coffee shop. It was almost empty save for a few people tapping away on laptops and sipping steaming lattes. Grinning, Kaylee gave her a quick hug and again plunged outside. Edwin’s text said he’d picked a place for them to have dinner just a few streets away. Kaylee felt a little guilty as she crossed the road and pushed against the wind towards the address he’d given her. Leaving Jade alone was never fun, but her friend had been more than understanding about Kaylee and Edwin’s growing relationship. And it wasn’t like Kaylee ditched her every five seconds to be with him. Since they’d started dating almost five months ago, she and Edwin had taken maybe two actual dates if she didn’t count joint training sessions (which she definitely didn’t). Between Kaylee’s sessions with Randy, Edwin’s growing responsibilities as a Merlin within the Convocation ranks, and the murderous amount of work school seemed determined to heave on them, it was a wonder they had time to meet even now. Kaylee spotted Edwin through the latest swirl snow flurries. He was bundled in a puffy down jacket, his face and head obscured by a wool hat and scarf, but Kaylee could still tell it was him. If the curly hair and fogging up glasses weren’t a dead giveaway, then Edwin’s wiry frame, still visible despite his layers, would have given it away. He turned and spotted her, pulling down his scarf to give her a dazzling smile. Kaylee stopped, nearly slipping on a patch of ice. Her heart had started pounding wildly in her chest. Was it from one cheesy smile? Sure, Edwin had filled out even more through the summer and yeah, he was still skinny as a scarecrow, but now he was a muscular scarecrow, his new bulk impossible to hide. His magic had grown too. She might have been imagining it, but the air around him seemed to crackle with energy. As a Merlin, he’d come a long way from the awkward, bumbling magic wielder she’d first met. Then again, maybe he was still awkward. Either way, Kaylee couldn’t help snorting and giving him a quick kiss, their frozen lips briefly sticking to one another’s. The restaurant was far fancier than Kaylee had imagined. Edwin’s family came from serious money, but even this seemed extravagant. White tablecloths topped with gently burning candles were spread across a comfortably enclosed room. Murals of rural landscapes were painted over archways leading to more secluded dining areas. An actual violinist played soothing music from one of the far corners. The server led them to a private windowed alcove that held just a few tables. The space was pleasantly warm and inviting, lit by a single roaring fireplace at their back. They sat and the server brought them water and menus. Kaylee stifled a gasp at the prices. They settled into more comfortable banter after that. Kaylee hadn’t realized how nervous she’d been until that moment. Or even how nervous Edwin was. He acted as though taking her on one date was the greatest thing to ever happen to him; that he couldn’t screw this up no matter what. Kaylee wondered if he knew that’s exactly how she felt about him. After they’d ordered Edwin relaxed in his chair. His hand clasped hers across the table as they both stared out the window at the worsening storm. Kaylee savored the silence, just sitting with each other, comfortable, content. “Were you with Jade?” Edwin finally said. A log shifted on the fire, the flare of light casting the right side of Edwin’s face in sharp relief. Beneath the collar of his sweater Kaylee caught the beginnings of a nasty cut. A knife wound most likely. Kaylee knew what they looked like. She’d been on the receiving end of a fair few of them. And they were. 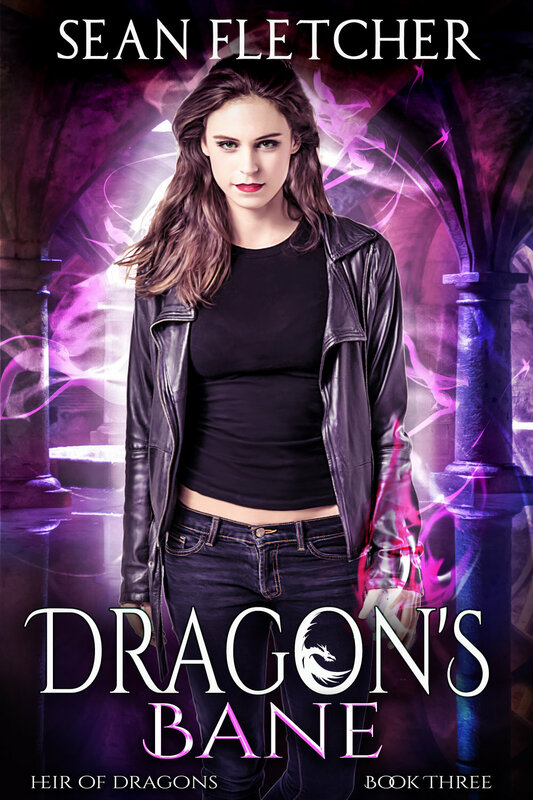 As a storm dragon-kin, a half dragon half human who could control thunderstorms, Kaylee’s magic had been…temperamental. She’d only recently learned to control a small storm without it blowing up in her face—sometimes literally. Shifting her arms, feet, and stomach to dragon scales was getting easier with each passing lesson, but still not a breeze. The wings, as Randy so kindly reminded her, were a work in progress. “What’d you guys find out?” Kaylee said. Kaylee shivered. Ever since the battle at the Rothsburg museum, she hadn’t been able to get the image of the Herald—as well as the ember-eyed man she’d seen when she’d briefly died—out of her mind. The Herald, it was said, could summon the Hunt, the bane of all dragon-kin, led by the original Slayer himself, St. George. The Herald had been hard enough to knock back into whatever hell he’d crawled from, but if the Slayers managed to find another way to summon the Hunt then their situation would become ten times worse. As far as she knew, anyway. He been a Slayer until Lesuvius, leader of the Slayers, had ordered him to kill Kaylee and Reese figured that maybe, just maybe, murdering his family wasn’t something he wanted to live with the rest of his life. “Have you been in touch lately?” Edwin said, a note of concern in his voice. Kaylee was grateful for how genuinely interested he looked in her answer. When others asked where her brother was they seemed to do it out of obligation rather than the actual desire to know. Edwin laughed. Then his eyes flickered to the window. He stood. Kaylee stood beside him. The storm outside was blowing harder, making it difficult to see anything on the street through the sheets of sleet and snow. Something monstrously large slammed into the window. The frame buckled inward, scattering glass across their table. Just as quickly as it hit, the thing peeled itself away and lumbered away. A second later a roar tore from down the street. “W-what was that?” The waitress continued sputtering. “I think it was a bird, right Kaylee?” Edwin said. The pair rushed to grab their coats, the entire time Kaylee fighting her rising resentment at missing yet another date with Edwin. She shouldn’t feel bad. This was important. Whatever that thing was hadn’t been natural, and they were the only ones nearby equipped the handle it. She should have been happy to do something. She should have been eager. So why did she still feel angry? Kaylee nearly slipped on a patch of ice as they rushed out the front door, Edwin managing to catch her with one arm. He glanced quickly around and, once he was sure nobody else could see, conjured a ball of orange magic in his hand. He used his other hand to shape the magic into a sort of glow stick, which he held out in front of them as they moved cautiously down the road. “Hold on!” Kaylee yelled. She held her hands up, calling on the magic within. Her hands were soon covered in a thick layer of black scales. The familiar buzz of power raced up her arms, arcing between her fingers, now turned into thick claws strong enough to slice through metal and clothing alike. A dark shape darted from one rooftop to the next, cutting the distance between them in an instant. Kaylee whirled, already shouting for Edwin to watch out. The lumbering shape lunged. Kaylee was aware of leathery wings unfolding from the thing’s back as it plummeted towards them. She crossed her scaled arms in front, bracing for the blow as it came. Claws raked her chest, luckily protected by the rest of her scales. The force knocked her away like a wad of paper in a wind tunnel. She hit the brick wall across the street and slid to the ground. She was vaguely aware of Edwin yelling, followed by the flash of orange magic as he engaged whatever had attacked her. Another flap of leathery wings and the shape vanished into the sky again. Kaylee struggled to her feet. Her mouth tasted coppery. Her leg had twisted beneath her when she hit and her knee throbbed where she landed on it. Edwin gulped. It took Kaylee a second to realize he looked scared. Like, really scared. The concrete cracked as an immense creature landed in front of them. Kaylee found herself blinking over and over again. Each time she expected the image to change but it never wavered from the reptilian snout to human-less eyes to thick, scaled arms and legs.